Gravyty was so excited to be such a big part of last week’s CASE District II Conference in Philadelphia. 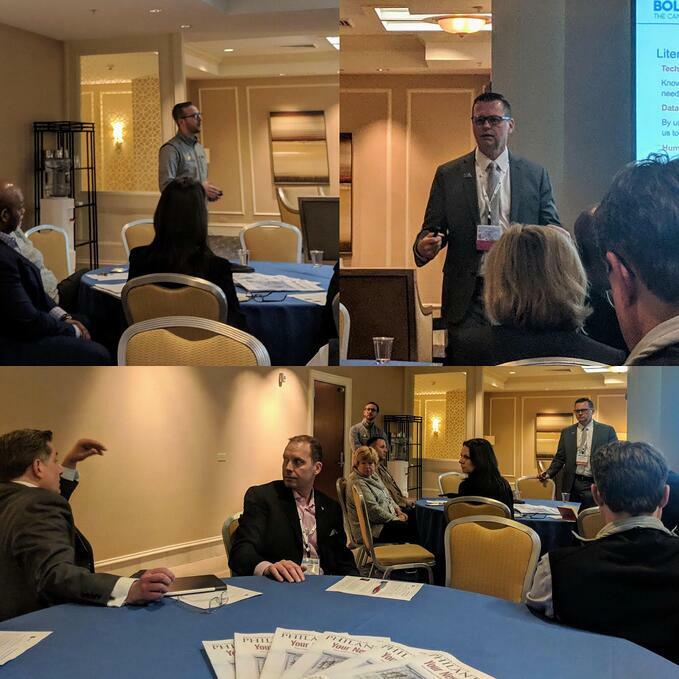 Our CEO Adam Martel teamed up with Gravyty customer and friend Rod Grabowski, VP of Advancement of University at Buffalo, to lead a discussion for a room of advancement industry leaders, titled Artificial Intelligence and Major Gift Fundraising: Driving Action for Frontline Fundraisers. Adam and Rod are both members of the AAAC, the first council which strategizes around the best use of AI in advancement, and recently were featured in the Chronicle of Philanthropy’s latest cover story which focused on the same topic. Together they co-presented on why advancement teams should start looking at bringing AI into their work processes to help increase bandwidth and boost productivity levels amongst frontline fundraisers. Gravyty CEO Adam Martel (top left) and University at Buffalo VP of Advancement Rod Grabowski (top right) leading a discussion on how artificial intelligence drives action for major gift fundraising. Several sessions at CASE DII addressed prominent concerns amongst advancement industry leaders, including: Major gift/annual giving relationships, how to navigate complex gifts, using data in development strategy, etc. There was, however, little discussion around fundraising efficiency and process except during Adam and Rod’s presentation on AI-enabled fundraising. University at Buffalo is one of the many Gravyty customers who have used AI to expand their advancement team’s workforce by as much as 160%, without needing to make additional hires or increase workload, which is why Rod had a lot to say for professionals in this space hesitating to embrace such a transformative technology. We look forward to continuing along the track of increasing AI awareness & enablement amongst advancement leaders at the next CASE conference! Want to learn more about how AI helps drive major gift action for frontline fundraisers? Get to know Gravyty today!